Sandra received her LLB (Hons.) from Birmingham City University and LLM from the University of Warwick. 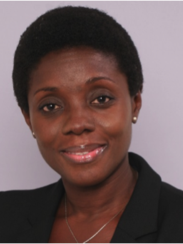 She is a member of the Ghana Bar Association, and currently a Lecturer at the GIMPA Law School. She was previously the Head of a Delegation of an international and national team of Advisers and Experts to the Government of Sierra Leone on the implementation of a four year Justice and Security Sector Strategy under the auspices of UKAID for a DFID funded Programme. Before this she had served as the Director, Judicial Reforms and Projects at the Judicial Service of Ghana, where she was in charge of the development and implementation of a nationwide judicial reform programme for the institutional strengt​hening and reformation of the Judicial Service and the Judiciary of Ghana. Her academic interests include Access to Justice, Human Rights, Peace Building and Conflict Resolution, Gender, Institutional Reforms and Development, Governance and sub sectors under Law in Development.